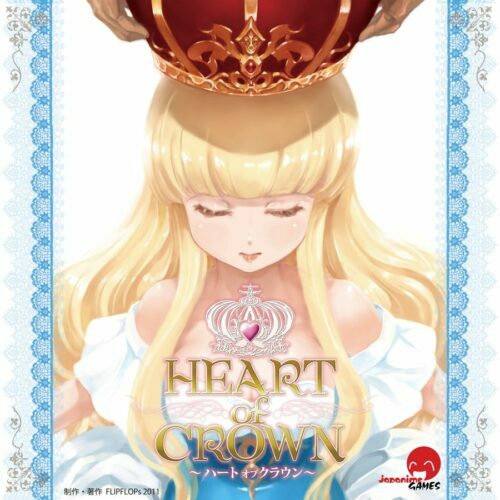 Heart of Crown, by Japanime Games, definitely does not fit in your pocket. In fact, it barely fits in a backpack. However, I am very happy to have the opportunity to review this game, because it is possibly the most beautiful game I have ever played. The matte-textured box is covered in artwork worthy of a manga and has a game synopsis that grabs your attention. The instruction booklet is an actual book, well-written, with no translation issues. The book starts with a game story and overview of the rules, before delving into setup and detailed rules. The rules include examples, illustrations, and even an FAQ. The cards are excellent quality, with clear text and lovely art. They even went the extra mile on the dividers used to organise the cards, so much so that when I first opened the box, I mistook them for more cards. By the way, I would highly recommend organising the cards before playing your first game, because you will be spending a lot of time looking for specific cards during game setup. One final thing I will mention about the packaging is that Japanime has thought ahead by leaving space in the box for the game’s two expansions, Far East Territory and Northern Enchantress. The story of the game is that Emperor Hellard has died with no clear male heirs, only 7 princesses. If the succession is not resolved quickly, the Empire that Hellard built may be destroyed by war. The players are all young apprentice maids, looking to raise their status by backing the princess that they hope will gain the throne. Everyone starts with the same 10 cards, 7 farming villages, and 3 apprentice maids, and in a deck-building style, use those simple cards to buy more cards, thus improving their deck and establishing their strategy. There are 7 different types of cards to work with: Princesses, which are backed with coins, and then supported with Succession Points; Territory, which raises money to buy cards, and later act as your Princess’ domain; Action cards, which allow you to do things like draw cards, reveal cards, trade cards, etc; Attacks, which let you punish your opponents; Defense cards, which protect you from Attacks; Succession cards, which give you points to support your Princess; and Calamities, which interact with other cards to insert curse events into the game. The game setup, which requires a fair bit of table space, consists of a Basic Market, for buying territory and succession characters; a Random Market, for buying Action cards, Attacks and Defences, the 6 Princess cards, a pile of Calamity cards, and a space for cards that have been “exiled”. Each player also needs room for a draw pile, a discard pile, and their Princess Domain. Gameplay is designed to let you go through your evolving deck effectively, by drawing 5 cards at the start of each turn, discarding all cards (whether played or not) at the end of the turn, and starting your next turn with a completely new hand of 5 cards. This, combined with several cards that let you draw cards, or move cards from your discard to your draw pile, means there is a good chance you will get to use that great card you spent all your hard earned coin on. The game is designed so that you can learn easily, and upgrade your deck quickly. Another advantage is that the more you learn, the more complicated the game can become, using a progression of recommended card sets that slowly add in more complicated game elements. If you enjoy a little chaos, you can even set aside the premade sets and try playing with a completely random set of cards. At the beginning of the game, your focus is on using coin earned from your territory cards to buy upgraded territories, supporters, and actions that will best improve your deck and match your strategy. Once you have backed your princess (which also requires coin), your goal switches to gaining Succession points from supporters such as Royal Maids, Dukes, and Senators, as well as some rare and valuable Imperial cards. Whoever gains 20 Succession Points can declare a Coronation; after that, the other players have one turn in which to try to declare a Coronation of their own. When more than one Coronation Ceremony is declared, the play goes into “sudden death overtime”, which goes until someone gets 30 Succession Points. We played this game at a mini gaming party at a friend’s house. We learned quite quickly, the game going fairly smoothly with only a few minor rule confusion hiccups. Since we each had our own playing styles, we all ended up trying different strategies. The second game was even faster, both because we were more familiar with the game, and because we had switched from a multiplayer to a two player game. The only thing that stopped us from going headlong into a third game was the need to stop for supper. As one player pointed out, the more you play, the more you realize the strategic value of the cards, especially the special abilities of the Princesses. This is the kind of game you can play over and over without getting bored. My only regret is that, even after reading the whole book and playing a couple games, I still don’t completely understand curse/calamity cards. I know that there are several action cards, mostly witches, that interact with the curses. Other than that, they seem to just take up space in your deck. But, as one player pointed out, this can be a punishment all by itself.